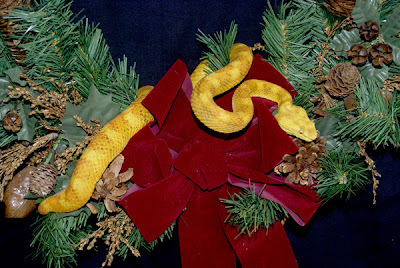 May your Christmas Wreaths be full of eyelash vipers! Darlene and I wish everyone a very Merry Christmas and the best for the coming New Year! Baby, that is one stunningly beautiful Christmas wreath! The photo and snake are both very impressive! The blue background is a nice touch. It seems to make the wreath and viper stand out even more. I agree with "D" that is one impressive wreath. Man, where did you find that thing?!! It's incredible! Mine just had pine cones and mistletoe on it. I've got to find a better Stein Mart!!! P.S. Don't you just love the words you can learn at the "word verification" sign-in stage of the blogger? I never knew that "isistleis" was even a word! If You Feed Them, They Will Come!